Is The Blockchain Lottery a Scam or Legit? Read Reviews! For those in the world that understand cryptocurrency and how blockchain works, and have confidence in downloading dapp called MetaMask, this is a one entry lottery that is played once a week. TheBlockchainLottery.io uses a cryptocurrency versus dollars for playing a lottery. There is only one, and it is played weekly. For people in the know, this might be fun, but for the rest of us regular players enjoying international lotteries going for those mega jackpots, this probably won’t interest you. This is one strange lottery. It’s called The Blockchain Lottery (more info shortly). Players choose a random number between 1 and 100. The draw lasts one week. If there is only you in the draw, then the date is extended, and you will be advised by email. There is only 1 ticket entry per address per draw. If you’ve won, your prize will automatically go to your wallet. Again more info shortly. The cost to enter is 0.01 ETH (estimated at US$ 1.75). The price fluctuates depending on the current exchange rate between bitcoin and US dollars. There is no information on what the weekly jackpot is, whether it accumulates or whether there is more than one tier of prizes. The only way to find out is to download MetaMask and then it looks like the information is available. This lottery is based on the use of Ethereum. This is a cryptocurrency that doesn’t reside in a bank or the hands of a single person. You hold your cryptocurrency information in a wallet though the data is stored in a ledger/database called a blockchain. Most normal web browsers aren’t user-friendly for dealing with blockchain. TheBlockchainLottery.io recommends using MetaMask which can be downloaded. This is a decentralized app (dapp). It isn’t a single server but uses links a browser extension to your regular browser. It’s the wallet that stores your accounts or addresses and private keys. There are two parts to a wallet – a private key and a public key. The private key is a 64 character code that uses a combination of A to F letters and 1 to 9 numbers. It’s secure, and the only person who gets to see it is you. The public key is an identifier for your wallet, but people can’t see anything besides that. It also creates an address which people can send you cryptocurrency to. 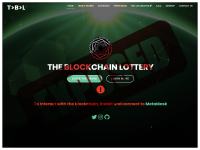 Anyone can play at TheBlockchainLottery.io – you need cryptocurrency, and a understand how to use MetaMask. The positive side is it is totally off the grid for taxes and having to tell anyone that you won. This is no information on how these folks are except that the site was developed in the UK. There are an email address and an online form. There isn’t a snail mail address, phone numbers or live chat. Would you mind rating TheBlockchainLottery.io? I guess for people who regularly dabble in blockchain and cryptocurrencies; this site might make a bit of sense. But for the rest of us regular international lottery players, it’s just beyond me. When I want to go for a jackpot, I’m looking for real money that I can take to the bank. This site gets a thumb’s down mostly as it only has one lottery and in a cryptocurrency that not only fluctuates in value but what you win depends on how many are playing. Give me US Powerball or EuroMillions any day – love their jackpots.